With this price I can not buy them anywhere else. They work great and heat up the chaffing dishes so quickly with out making any fumes or smoke. Worked great for the catering event. It kept the food hot and lasted just over the 2 hours. Will definatly order again for the next event! These @ Hour Ethanol Gell Chafing Dish Fuel burners came in handy for our Church plate sale! The perfect length of time to set up the lunch, add the burners to keep warm during service, and as soon as we served the food they went out. Perfect. no mess, no waste, and the food was hot and no issues with food safety from serving luke warm food! Id purchase again. Great price great value. These are super useful for parties when you want your food heated. They can be used with any tray from aluminum to stainless steel. You get enough time to serve your food nice and warm for your guests. This worked exactly how I needed them to. The burned throughout the event, and lit up immediately. The gel lit as soon as the flame was near. This fuel seems to work better than most brands. Easy to open, easy to light and lasts longer than most products we have tried over time. We purchased these Ethanol Gel Fuel cans for an event we hosted this past weekend to keep some of the dishes warm. I’m use to the ‘wick’ fuel cans but these were far less more cheaper and a lot easier to open up. The run for 2hrs... start up really fast once your lighter or match hits that gel. I noticed they do burn with a HIGH flame and also put off sort of a ‘torching’ sound. Due to the high flame and force of these cans we had to blow them out 1/2 way because it was literally cooking our food from all that heat hahaha... such a powerful little can. Great Fuel for chafers, no fumes to worry about and keeps food hot at a adequate temperature. I will surely buy more in the future. Fuel lasted well over 2 hours for an event I catered. Only needed to use 2 burner per chafing dish it was really hotand kept food warm until I put it out myself!! I was not happy with the product the fire lasted only 1.5 hours and some of the cans very badly damaged maybe I just got a bad pack would not recommend. We appreciate your feedback! We’re sorry this arrived damaged. A Customer Solutions Representative will be contacting you soon. A economical alternative to brand named chaffing fuel and this price is better than any big box store or other vendor. I would recompensed the larger sized pack, if you need that many. Great value for the product! I am looking forward to using them at my next event and will share durability once i use them that day! I ordered these to use with the mini hibachi grills that they also sell on this website. Because it is flammable, they are shipped ground; however, they still arrived very quickly. The gel was easy to scoop into the hibachi grills without making any mess. I found that about half a can would burn for 20 minutes. These green ethanol gel fuel burns cleaner and without the smell of regular sterno. This makes a more pleasant presentation on the food service table. These were the best fuels I've purchased in a while. I've tried the dollar store brands and they were a total waste. They were easy to open l.
I love these little guys! They are so easy to light and stay lit for hours. No smell to them and they keep the food warm. These are an excellent value for basic gel chafing fuel cans. They are high quality and very reliable. But if you want to upgrade to the next level, you must try the Choice brand Wick chafing fuel! This fuel does the job! It burns for about 2 hours, so if you have a long event, don't go with this one. I can get an extra hour of warm food if I heat the food before and start with hot water rather than cold. 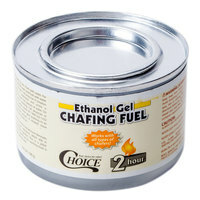 I purchased these Ethanol Gel Chafing Dish Fuel to use for our catering events. They work great and last a long time. Makes catering easier. This fuel was fantastic for use with the chafing dishes and it had no odor at all. It burned clean and plenty long for the duration of my event I used it for. I would definitely order it again whe I need to restock! Good product for the price. The fuel lasts as described and we are happy to use them every day. Keep the lid to put them out and you are good to go! These worked perfectly! No oder from burning, and no guessing about the life left in burner at the end....simply throw them away because the avg service time is 2hrs anyway. So glad I don't have to store for later use, these are ideal for one time use. The Choice Ethanol is a Great Item. Easy to use. They were Great for my 6 hour Birthday Celebration. I would recommend this item for your next party. Great price. This is a standard heat source. No issues, pretty good product. This fits under a regular chafing dish. Good price for the pack and fast shipping. Another great deal from Webstaurant! These burn clean and last mininmum 2 hours or more. They don't emit any odor,,,they are spill proof so are safer to use. They fit inside the holding cups for a chafer with still being able to slide the lid over it to control heat or snuff it out! This product worked really well. I used it for a catering event to keep foods warm. No complaints from the customers that the food was cold. I also purchased the stand and pans and it worked out perfectly. We love using this chafer fuel and it works well and does hold up for the 2 1/2 hours we need it. The price of the fuel is excellent but shipping can be costly. Let's face it, where else can you get a 12 pack of chafing dish fuel cans for this price, but at from the Webstaurantstore? As usual, I did a little research online and at local stores and each of them failed to coming close. I am very pleased! I purchased these to use at 2 events. I was a little skeptical due to them only lasting for 2 hours. However, I was pleasantly amazed that they actually kept the food steaming hot. Even after the 2 hours ended, the food in the chafers remained at a warm temperature. Also the packaging was excellent; they came in a box which was wrapped in plastic, and then inserted in another box. That was very important in case one of them accidently opened during shipment. I paid 1/2 on webstaurant for what the major retail stores and they exceeded my expectations. Great buy! worked great! Kept our food at a graduation party really warm! The only "bad" thing about them is they are only 2 hours but we just changed them when needed. Its gelled formula provided a high heat output than the conventional wick fuels that I have previously used and burns for over 2 hours. It was also easy to light, odorless, and burns clean without leaving residue. The Ethanol Gel was exactly what we was needing and asking for. These cans did the job very well and I would defiantly would order and use these again for the next party thanks to webstaurantstore! This is a pretty good price on these. Cheaper than you are going to get them at your restaurant supply house or anywhere else. Last long. These were not what I had originally ordered but I got an email from webstaurantatore.com because the ones I ordered were not able to be shipped to me. Over email and within 20 minutes of placing my order they fixed my order and found me these. Worked great for what I needed and the customer service was awesome! Thank you! i love choice ethanol gel chafing dish fuel the flame is strong and wide .i did so money kinds of food .i use it everyday . This is a great product. We made a lot of fondue this winter, and this kept our cheese nice and bubble for 2 hours. The first shipment was damaged (with ethanol fuel everywhere! ), but Webstaurant replaced right away which was much appreciated. This product is reliable and safe. This is such a great price for fuel as opposed to paying high local rates. They burn for 2 hours as indicated and I would purchase again. Good product, the gel is easy to scoop if you want to use less, burns steadily and has no smell, so it does burn clean. Happy with the price too. very reasonable prices for fuel gel. We didn't use half of what we thought we would need and they burned clean with no odor. Would order again. An excellent product. With this fuel you just use room temp. water and as long as you give it enough time it will come right to temp. I also like the fact that you don't have to but a whole case. Figured I'd give these a shot. not knowing if I had enough of the ones we usually have in stock. Great price online and fast shipping.